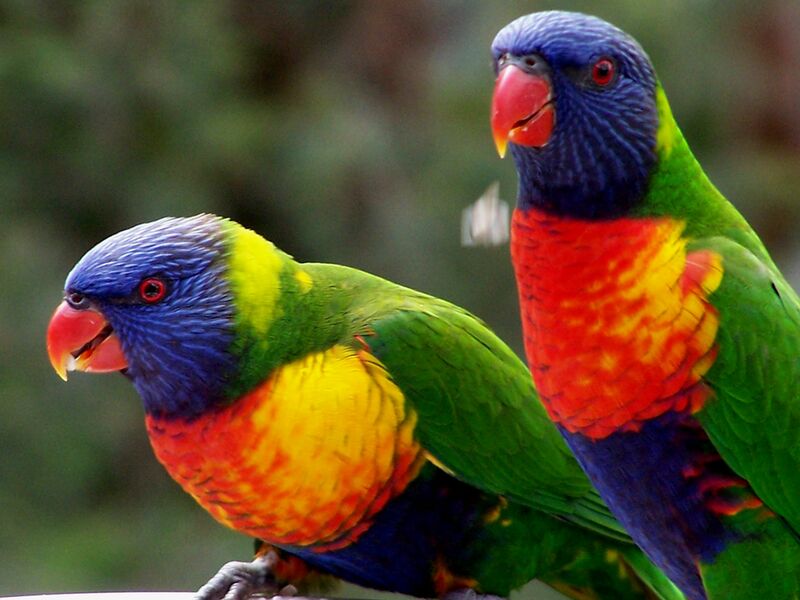 Psittacus haematod (sic.) Linnaeus, 1771, Ambon. Twenty-two subspecies. 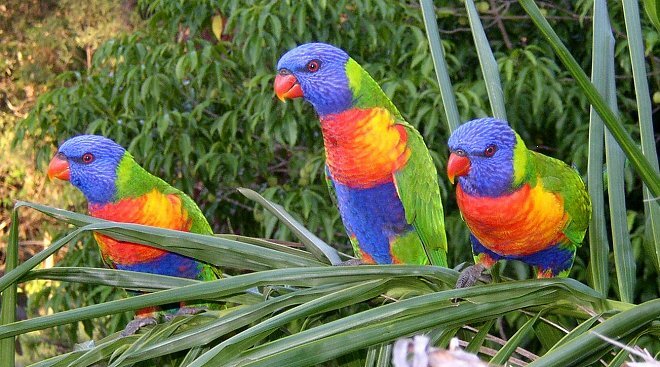 English: Rainbow lory, coconut lory; French: Loriquet а tкte bleue; German: Allfarblori; Spanish: Lori Arcoiris. 10 in (26 cm); 3.5–5.8 oz (100–167 g). Brightly colored bird with red, yellow, and green plumage; long, tapering tail. Polytypic species with geographical variation in colors of head and breast. T. h. haematodus: south Moluccas, west Papuan Islands, and northwest New Guinea, Indonesia. T. h. mitchelli: Bali and Lombok, Indonesia. T. h. foresteni: Sumbawa, Indonesia. T. h. djampeanus: Tanahjampea, Indonesia. T. h. stresemanni: Kalaotoa, Indonesia. T. h. fortis: Sumba, Indonesia. T. h. weberi: Flores, Indonesia. T. h. capistratus: Timor. T. h. flavotectus: Wetar and Romang, Indonesia. T. h. rosenbergii: Biak Island, Irian Jaya, Indonesia. T. h. intermedius: north New Guinea. T. h. imicropteryx: east New Guinea. T. h. caeruleiceps: south New Guinea. T. h. nigrogularis: Aru and east Kai Islands, Indonesia. T. h. brooki: Spirit Island, in Aru Islands, Indonesia. T. h. massena: Karkar Island, Bismarck Archipelago, Solomon Islands, and Vanuatu. T. h. flavicans: New Hanover and Admiralty Islands, Papua New Guinea. T. h. nesophilus: Ninigo and Hermit Islands, Papua New Guinea. T. h. deplanchii: New Caledonia and Loyalty Islands. T. h. septentrionalis: Cape York Peninsula, north Australia. T. h. moluccanus: east Australia; introduced to southwest Australia. T. h. rubritorquis: north Australia. Lowlands to mid-montane elevations. Wide variety of wooded habitats wherever flowering plants are available, ranging from mangroves and coastal heathlands to savanna woodland, gallery forest, secondary growth, and rainforest; colonizes man-made habitats, especially coconut plantations, orchards, and suburban gardens; prefers edges or clearings rather than interior of closed rainforest; tolerates depauperate scrubland or plantations on quite small atolls. Resident, though pronounced local movements in response to flowering of food plants causes marked fluctuations in numbers. In pairs or flocks of few birds to hundreds depending on food availability; noisy and active, constantly flying back and forth through or above canopy and clambering amidst foliage to get at flowers or fruits; screeching call-notes always betray presence; often in company of other fruit-eating birds; becomes tame in household gardens or at feeders; very swift, direct flight. Compressed, pointed bill and “brush-tipped” tongue used to extract pollen and nectar from flowers; also fruits, berries, seeds, leaf buds, and insect larvae; in Australia, feeds principally on Eucalyptus and Banksia flowers; fond of cultivated fruits and unripe “milky” grain; readily comes to garden feeders to take fruit, seed, or artificial nectar mixes. 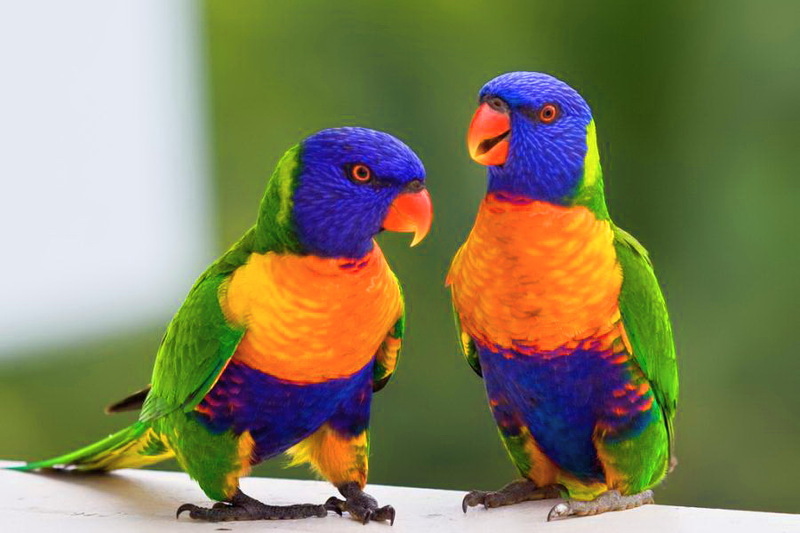 Monogamous, paired birds staying together and readily discernible within flocks. Breeding season variable in different parts of range, but nesting recorded most months. Courtship display features wing-fluttering to show colorful underwings, side-to-side swaying with neck arched forward and eye pupils dilated; nest in tree-hollow; at times two or more nests in same tree, but hollow entrances defended; nesting on ground recorded from Admiralty Islands, Papua New Guinea; clutch of two to three eggs incubated by female for about 25 days; young birds fledge at about eight weeks. 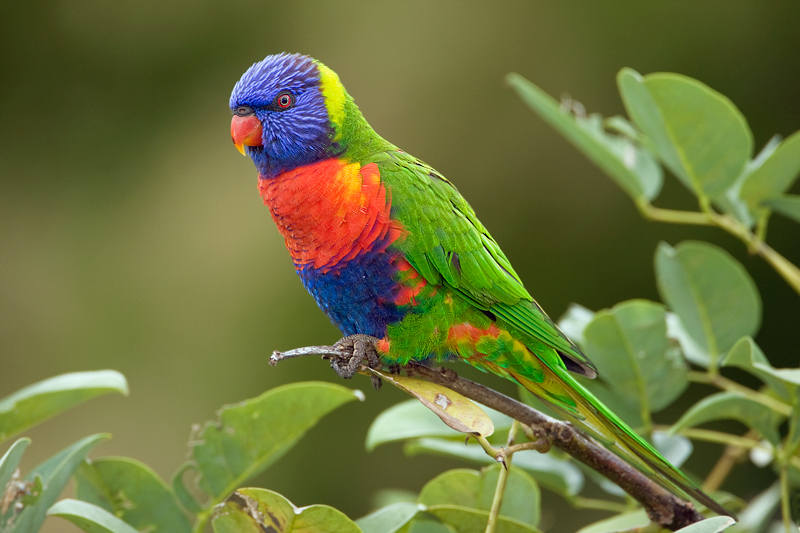 Generally common, locally plentiful; in some districts most common parrot; in Australia, benefits from cultivation of native flowering plants in gardens, and numbers increasing. Listed on CITES Appendix II. 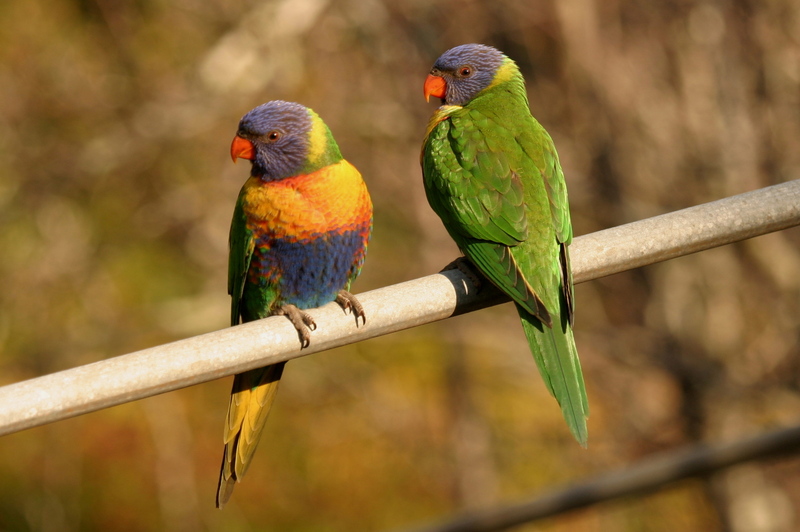 In Australia, popular visitor to garden feeders, and major attraction at tourist parks where hundreds come to feed from trays held by visitors. In some regions hunted for food and feathers, latter used in ceremonial headdresses.